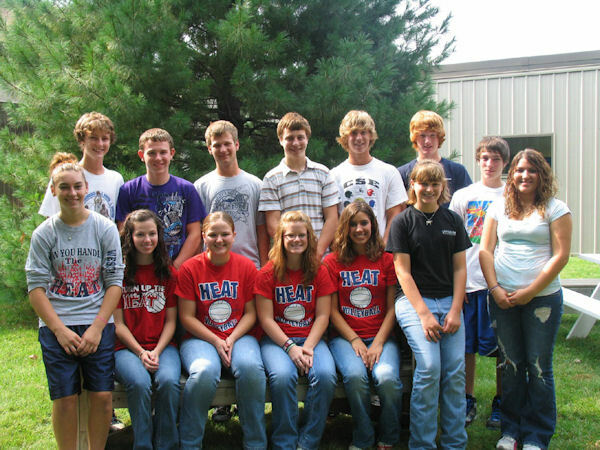 Students at West Central High School made their selections for Homecoming Candidates and Court for their 2010 Homecoming. The freshmen escorts are Sydney Bigger. Sydney is the daughter of Barry and Jody Bigger. She is a student council representative and participates in dance, scholastic bowl, FFA, and the FIRE service club. Joshua Myatt is the son of Steve Myatt and Deborah Beam. He participates in cross country, baseball, and track. Sophomore escorts selected by their class are Jessica Ditsworth and Evan Bell. Jessica, the daughter of Jayson Ditsworth and Lisa Graber, is active in volleyball and softball. The son of Brian and Julie Bell, Evan Bell is involved in football, track, and student council. Junior escorts for Homecoming 2010 are Ashley Gittings and Chris Cooper. Ashley is the daughter of Amanda and Bob Carpenter. She is involved in National Honor Society, Future Business Leaders of America, and cheerleading. Chris Cooper, the son of Scott and Betsy Cooper, enjoys football and FFA. Returning to pass on the honors to this year's Homecoming Queen and King will be the 2009 Homecoming Queen, Justine Dillard. She is the daughter of Scott and Joni Dillard. Justine is currently a student at the University of Iowa. Last year's king, Jesse Sams, is the son of Doug Sams and Ronda Sauder Sams. Jesse, a freshman at Eureka College, is busy playing football for Eureka. Walking with Justine and Jesse during Saturday's coronation will be the Homecoming 2010 tiara bearer and crown bearer. Elaina Fisher is serving as the tiara bearer for the 2010 Homecoming Queen. Elaina is the daughter of Garrett and Jena Fisher. With her will be Cameron Shutwell, son of Chad and Tessa Shutwell. Cameron has the honor of presenting the official Homecoming 2010 football to the King during the coronation. The senior class selected eight talented individuals as candidates for Homecoming Queen and King! They are Taylor Cupps, Alexis Foster, Mary Lewis, Hillary Pence, Dylan Bell, Nick Daniels, Ethan Lafary, and Logan Stogdill. Taylor is the daughter of Tom and Terry Cupps. She is active in volleyball, basketball, National Honor Society, FFA, youth coalition, senior class treasurer, Spanish Club, and the school newspaper. After graduation, Taylor plans to attend college to earn a degree in speech pathology. Dylan Bell has participated in football, track, student council, and National Honor Society while in high school. Dylan is the son of Brian and Julie Bell. After graduation, he wants to attend college and pursue a career in pharmacy. The daughter of David and Kelli Vancil, Alexis Foster is active in volleyball, cheerleading, band, and National Honor Society. Her intentions after high school are to attend college and become a veterinarian. Nick Daniels is the son of Russ and Patty Daniels. He has participated in football, baseball, scholastic bowl, ICTM math competitions, and student council. Nick's future plans are to attend Monmouth College and a career in a medical field. Mary Lewis is the daughter of Kirk and Laura Lewis. Mary has stayed busy throughout high school with volleyball, basketball, band, scholastic bowl, student council, National Honor Society, drama club, and Spanish club. She is also serving as the Student Council secretary this year. After graduation, Mary will attend university. The son of Scott and Dana Lafary, Ethan Lafary is active in golf, basketball, baseball, and National Honor Society. After graduation Ethan plans to go to college and would love to play golf for a college team. Hillary Pence, daughter of Mike and Carla Pence, is also a candidate for Homecoming queen. Hillary participates in volleyball, softball, FFA, yearbook, and National Honor Society. After graduation she plans to attend college and earn a registered nursing certification. She would like to work in a trauma center or in an acute care center in the future. Logan Stogdill is the son of Randy Stogdill and Julia Stogdill. Logan has made the most of his time in high school by participating in basketball, bowling, baseball, and Spanish Club. Future plans include college and a career in a medical field. The Homecoming Dance is Saturday, October 1, from seven o'clock p.m. to ten o'clock p.m. Coronation takes place at nine o'clock p.m. where the Homecoming 2010 Queen and King will be crowned. Parents and friends who would like to observe coronation are welcome to arrive at 8:45 p.m. at the West Central High School gym for a wonderful "Beach Party" celebration Homecoming Dance!